Aug 19 What's wrong with this picture? Here is a challenge for our readers. Spot all the things wrong with this picture. Answers posted below the photo. See how my blanket is on the couch? That is my spot. Do you see me in that spot? NO! What you do see on MY spot is some of Mom's law books. Apparently she doesn't get that I am supposed to sit in my spot, not books. 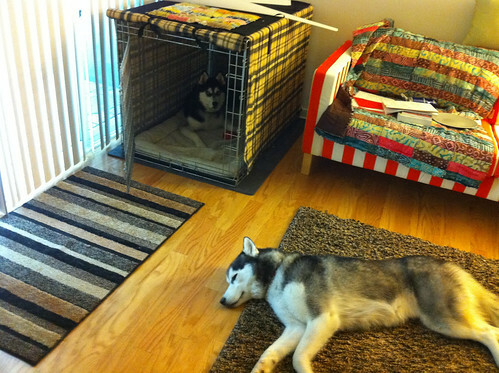 So to punish her, I went to my crate. I never stay in my crate when she is home, so it makes her think there is something wrong with me and now she will worry. Maybe she will worry so much that she moves her stuff out of my spot. Aug 25 I'm a super helpful canine!